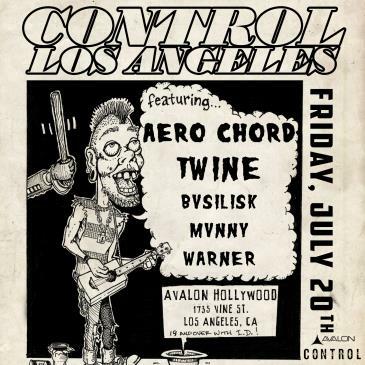 On July 20th, CONTROL Fridays at AVALON Hollywood is hosting another evening of intense trap and dubstep from headliners Aero Chord and Twine and support from Mvnny and Warner. Aero Chord, originally from Greece but since relocated to LA and will be gracing the AVALON stage. This producer has a wide range of sounds from dreamy pop to future trap. He has earned support and recognition from the likes of Skrillex, Diplo, Flux Pavilion, and more. As part of the label, Monstercat, he has been able to tap into his expansive creativity. With so much up his sleeve, Aero Chord is gearing up for a good show. Alongside Aero Chord, Twine will be coming to Los Angeles and oh boy is he a true bass music powerhouse. His track “My Crew” feature his innovative techniques including electric guitar alongside filthy beats. This producer has gone on tour with Getter and is a part of the Never Say Die family. Twine’s bass is heavy hitting, and has made him a force to be reckoned with and something to be witnessed this Friday at AVALON Hollywood. Gear up for another smashing edition of CONTROL at AVALON with bass music stars Aero Chord, Twine, and local support from Mvnny and Warner this Friday July 20th.